Our aim is to collect and redistribute all spare, unwanted and surplus hearing aids, ancillary hearing equipment and serviceable batteries. In the majority of cases redistribution will be to emerging nations but cases have occurred where there is a need in developed countries. In 2013, we have processed in excess of 56,000 aids! Sound Seekers and Starkey Hearing Foundation who help ensure the refurbished equipment reaches the people who need it most. 1. To send small numbers of hearing aids and batteries remove their boxes (to save you postage costs) and post only the bare hearing aids and batteries to Lion Vic Truluck MBE, 24 Fearon Road, Hastings TN34 2DL. If you have a problem paying for postage please contact me. 2. If you have a large amount of hearing equipment to donate, you can send it FREE. Address it to: Lion Vic Truluck MBE, 24 Fearon Road, Hastings, TN34 2DL. Ring Parcel Force on 0844 800 4466; follow their instructions for those with a contract. When they answer quote Contract R233259, and say the contract is in the name of Lions Clubs International. Ask for 48 hour service & they will take details & come and pick the package up. We ask you to put a note inside saying who you are. Then we will acknowledge receipt. May we emphasise that this service is for large parcels. 3. For Lions Clubs who are sending hearing aids with spectacles, carry on sending the hearing aids to Chichester in a separate bag marked “For Hastings” and they will be sent on to us. 4. Hospitals, NHS Trusts and the like who would like some publicity, please contact Lion Vic by email, verbic@hastingslions.org.uk If possible we will arrange a collection with a photo opportunity for your and our use. 11 Jan. 2013 gets off to an unusually quiet start and it is not until our Hastings Lions business meeting that I collect 8 hearing aids from our local bins. Well it is a start. 12 Jan. Ah that’s better, Colin at Frankland Prison sends 1450 hearing aids for the store. That should do for the next few weeks, thanks. 12 Jan. 200 hearing aids are on their way to Wellawatte West Lions Club in advance of us going to Sri Lanka next month. We will take more and loads of batteries if we can. 14 Jan. A big box of probably 1,000 hearing aids are off to Frankland to keep them topped up. 14 Jan. 33 hearing aids arrive from the audiologists at Heywood barracks in Germany plus some ancillary equipment. The have just missed to post taking the big box to Frankland but will be the first of the next. 16 Jan. 600+ hearing aids are sent on their way to Mike Nolan in the frozen north to top up his Hearing Foundation stock and maybe onward to Soundseekers. 17 Jan. 100 aids are popping across the Channel to Hervé in Eu Lions Club. He will be off on his annual visit to the Ukraine shortly. 19 Jan. An absolutely dinky pair of Widex BTE hearing aids have arrived from a lady in Earl Shilton, Leicestershire. Some will treasure them I am sure. 21 Jan. The postman battles his way through the few flakes of snow that have ground the south-east to a near halt yet again! He brings the gift of two welcome hearing aids and some batteries from Epping in Essex. 24 Jan. Two C addresses but miles apart, one packet from Arnside in Cumbria and the other from Chipping Norton. Both are most welcome, thank you very much. 25 Jan. We are working the postman hard this week as he brings two packets from east and west this time. One from Potterne in Wiltshire and the other from just up the road in Burwash, which is of souse Kipling country. Thank ladies for your kindness. 28 Jan. A kind lady from Ealing sends us two more hearing aids to add to those she gave us last year. We will make good use of them. 29 Jan. My good friend and colleague in the Hastings Lions drops in his old hearing aid. They come from far and near! 31 Jan. A promised special mobile phone is delivered by the postman from a lady of The Lakes, Bowness-on- Windermere to be precise. It will be donated to our friends in the East Sussex Hearing Resource Centre. Oh how many times have we tramped around that area in the past! 1 Feb. A goodly haul of sorted hearing aids arrive from Honiton Hearing Centre in glorious Devon, well done and thanks. 3 Feb. We had a splendid weekend in chilly Folkestone at our Lions convention as a result of which we brought back a vast number of hearing aids and other equipment. We have never had anything delivered so big that it was on casters, which turn out to be a Natus Colour Newborn Hearing Screener. I have no idea what it is but I bet the professionals will desire it! 6 Feb. My Hastings Lions colleague John and I sort through the hearing equipment we brought back. It adds up to around 20,000 hearing aids plus two I-pro boxes, radio aids and speech trainers. Bearing in mind that we processed a record 30,000 in all 2012, to do this in one month is bordering on the miraculous. We are so grateful to Dunstable Lions Club, Northampton General Hospital, Withybush Hospital in Haverford West, Pontefract Hospital, the Hearing Care Centre in Ipswich and many more that are not identified what a record! 7 Feb. The brave lad from Parcelforce staggered away with four large boxes of hearing aids for the prison and a slightly smaller one for Mike Nolan and Starkey hearing Foundation. 13 Feb. Just as we are off to Sri Lanka delivering 300 hearing aids, batteries, and key rings the postman delivers two hearing aids from our Lions HQ in Birmingham. 27 Feb. Bernice and I are returned. While in Sri Lanka were the guests at the 10th annual convention of the College of Otorhinolaryngologists and head and neck Surgeons, who kindly honoured me. We donated 150 hearing aids each to the Colombo General and to the Colombo South Hospitals. The Wellawatte West Lions entertained us royally as usual. 27 Feb. In the pile of mail that inevitably results from two weeks ago were three welcome packets containing hearing aids from Jeff and Glyn Dobson of Teesdale Lions, Amplifon in Leeds and an unknown lady called Linda. 6 Mar. A double donation day for some hearing aids are picked up by our Hastings Lions. Then I go to our Conquest hospital on a routine appointment and collect a lovely bag of hearing aids from the audiologists. Indeed, a good day. 7 Mar. From Acousticare in Poole a pair of Spectacles with bone conductor hearing aids is received. These are unusual but will be very welcome to someone who is very deaf. 11 Mar. The Natus Newborn Hearing Screener is starting its journey today via our friends at Trico Freight, to Dr Chandra at the National Hospital in Sri Lanka. 11 Mar. We collect from Mandy at our Local Hastings Conquest Hospital not one but two Aurical Hi-pro test equipments. Manna from heaven and also destined for two other hospitals in Sri Lanka. 12 Mar. Trudging through the snow came the lovely chap from Parcelforce, brave soul. He delivered two large boxes of hearing aids from “Our Friends in the North” at Frank land Prison. 200 will be on their way to a new doctor in Sri Lanka. Well done Colin. 14 Mar. The two Aurical Hi-Pro start their journey to Sri Lanka today thanks to the generosity of Parcelforce and Trico Freight in Tottenham. They are heading for Colombo South Teaching Hospital and a new client, Dr Zaffarullah at Nawalapitiya. 14 Mar. A box of around 700 hearing aids is also on their way to Colin at Frankland Gaol. 15 Mar. Arrivals and departures since the Parcelforce chap struggles away and the postman brings a rather nice hearing aid from a lady in one of our favourite cities, Canterbury, thanks Liz. 18 Mar. In his accompanying note with four top quality hearing aids a gentleman living in the beautiful sounding village of Westbury Sub Mendip wrote, “Bob would have been delighted to know his hearing aids could be used in a good cause”. We will do our best Bob. 19 Mar. From our friend in the Eu, Normandy Lions, Hervé Matthieu-Bloise we receive a packet of 25 hearing aids and some batteries. This is fair exchange sine we sent him 50 for his annual visit to the Ukraine. 22 Mar. While the rest of the UK suffers beneath snow and flood up in Linsidemore, by Larg near Inverness they bask in spring sun. Not only has that but a fine citizen sent us three hearing aids and some batteries via our HQ in Birmingham, thank you. 26 Mar. Before he headed off on another overseas jaunt, this time to Tanzania, Michael Nolan sends two large boxes of equipment. Most of it will go to the East Sussex Hearing Resource Centre but there were also three Hi-Pro boxes; thank you Mike. 28 Mar. Our good friends at a local Hastings firm Trade Paints collect a large load of hearing equipment from the Chichester Lions. When it arrives it fills my Honda C-RV and includes among the hearing aids a public address system from Robin Rushton up in The Wirral. We also have a large box of hearing aids containing nearly 4000 hearing aids from a mystery donor in Gainsborough. In fact there are a number of mysteries in this load for why should Chichester Lions at one address send an Aurical digital tester and a box of miscellaneous items to themselves at another? Lion Carys Jones at Colwyn Bay also sent us a nice collection and a lady in London donates a TV listening system and some hearing aids. Lastly but by no means least Lions colleague sends us 72 more aids. Well done everyone and thanks. 1 Apr. No fools here because around 5000 hearing aids are on their way to Colin and the team at Frank land Gaol. Thanks to everyone who contributed recently. 4 Apr. I take a trip to Eastbourne to deliver a hoard of equipment that, for one reason or another cannot go abroad, to our friends at The East Sussex Hearing Resource Centre. At the same time I am able to collect a number of Aurical digital hearing aids testers which have been donated by the local audiological department. These are with Lion John of the Eastbourne Club who donates 344 hearing aids which he has garnered. A most productive morning and it brings our store of Auricals up to a dozen. All we need now is a qualified audiologist to ensure we can make complete working sets for distribution. Can anyone help please? 5 Apr. Sleet and snow, “Oh to be in England now that April’s here”. But the man from Parcelforce and the postman battle to the door with 5 audiometers and a parcel from a lady in Nottingham, donating her late Mother’s hearing aids. Our hats are off to all of you. 6 Apr. Two packages arrive, one from Lions HQ containing 2 hearing aids and the other from Dunmow in Essex with four, thank you. Dunmow is of course where a flitch of bacon is won. 17 Apr. In recent days we have had private donations from Milton Keynes, Tingewick nearby and where I refereed a football match in the 1950s. then today a box arrived from Snodland , Kent with goodies for East Sussex Hearing Resource Centre as well as six hearing aids; thank you very much everyone. 18 Apr. Bob Harvey our Rye Lions Club “mule” brings gifts from Chichester in the shape of two heavy boxes of hearing aids. It looks like a hefty offering will be heading north to Frankland soon. 19 Apr. Parcelforce bless ‘em deliver 200 awaited high powered aids 100 of which will be off to Ethiopia next week with our friend Carol Gupwell. 19 Apr. A lovely lady who had previously spoken to my wife sent a lovely modern hearing aid from a lovely sounding Welsh name Tan-y-Maes. That’s lovely! 24 Apr. There was a lady from Ealing or rather there is and she has sent us a beautifully wrapped Amplicom telephone, made especially for the hard of hearing. As BT compatible items are not usable overseas we will donate it to the East Sussex Hearing Resource Centre. 24 Apr. A thousand hearing aids and three speech trainers will be off to Islah in Leytonstone tomorrow for she will no doubt be off on one of her African jaunts shortly. 26 Apr. As a result of the recent Chichester hoard which includes a large number from Morecambe Bay and the Eastbourne Lions heap we can send around 5000 more hearing aids to Frank land, terrific. 27 Apr. Just in time to catch the big box of around 5,000 hearing aids heading north to Frankland on Monday a welcome box of aids and batteries are delivered by the postie from Val and Tony Parris of Burgess Hill Lions. Well done you two, especially for your timing. 11 May. Three donations from individuals have arrived recently from Horley, Thornton Cleveleys and Woking. We thank them for thinking of us. 16 May. Two hearing aids have arrived from “Disgusted of Burntisland in Fife”. He was told by his local hospital to throw them away. Can you believe that? 17 May. Five boxes of hearing equipment arrived last Sunday from our Chichester Lion chums. Alas, much of it had got jumbled on the way here so I am unable to acknowledge personally. However, there are about a thousand hearing aids for the prison to sort, a complete Aurical from the Royal Liverpool Hospital (I think), some listening items from a lovely sounding chap in Slindon West Sussex and a packet of aids from Tony Jones in Shakespeare Lions. Much of the bulky items will be donated to the East Sussex Hearing Resource Centre in Eastbourne. 20 May. As promised I take a car full of items to Eastbourne and the Hearing Resource Centre. On the way back there’s a table and chairs to pick up that we won on EBay (but that is irrelevant)! 27 May. Ten hearing aids arrive from a lady in SW19, London via our Birmingham HQ. They were left by her late neighbour for us. 29 May. Eight very welcome hearing aids and batteries are delivered from a lady in Royal Tunbridge Wells. They belonged to her late mother-in-law; thank you. 30 May. We have had a wonderful donation of eight hearing equipments, all with calibrations certificates. They were personally delivered by Lion Dr Dipankar Mukherjee from Bolton. We will find a home for all of these very easily. Watch this space! 31 May. We have had a pair of hearing aids sent from a lady in Amble Northumberland which were her late husband’s, thank you ma’am. From Google Earth I can see she has a lovely view from her house, except when nor-easter is blowing in winter! 2 June. An FP40 hearing aid analyser has just been collected for Colin and his men in Frankland to boost their capability. 5 June. We now have about a dozen audiometers that have arrived in various conditions from a friend of Glyn Vaughan at Swansea University. They are most welcome but such an embarrassment of riches makes me ask the question does anyone want one or more? 5 June. A large box of old hearing aids has arrived from our Lions Club colleagues in Kelkheim, Germany to go to the prison for checking. I must send our contact Dr Rudi 400 in return. 5 June. I had to visit our local Conquest Hospital on another matter so called in to the audiology department and found a number of old aids waiting for me. I also managed to scrounge a couple of pairs of eartips for my ex air force colleague now living in Pakistan. 5 June. A Jiffy bag arrived in the post containing two old aids and some batteries from Aberystwyth in Wales, thanks very much. 6 June. Ooh it has been a busy day! Two audiometers left for Islah and a sound level meter from Dr Mukharjee is off to All Ears Cambodia. 400 hearing aids are packed and ready for Islah tomorrow and Dr Rudi in Kelkeim Lions in Germany is getting another 400. 200 aids are in the post for Ophelia in the Philippines and 200 for Dr Chandra Jayasuriya in Colombo. Last but by no means least, 200 aids are in the post to Chitral in Wellawatte West Lions, also in Sri Lanka. That’s a lot of postage these days but in a good cause. 18 June. Hull is the address of the kind donor who has sent us a private hearing aid and some batteries, thank you. 20 June. We are having another good day. This morning the postman delivered 97 hearing aids which had been collected by Fairlop Lions and sent by Lion Doreen Carr. I believe this is the Club’s first donation but Doreen promises more. This afternoon Parcelforce delivered a monster box of hearing aids and other items from Gloucester Royal Hospital and facilitated by Dr Robin Youngs. He is working in Nepal and Burma in the next few months so we will try to supply him some aids to take there. I do hope we can help him with what he and his team need. 26 June. We have been sent via our friends at Acousticare in Poole a pair of modern in the ear hearing aids donated by a gentleman. We shall send them to Ophelia in the Philippines. 26 June. Delivered unto us this day are six very useful old hearing aids from a gentleman in Bexley, Kent; thank you sir. 29 June. It is officer changing times for the Lions on the first of July and at our handover coffee morning I had four aids given by our local collector. On getting home four more were waiting on the doorstep from our Lion friends in Teesdale, super! 3 July. All quiet and then whoosh, off we go! Not that we are complaining. I have just sent a mass of hearing aids off up to Frankland Prison to be cared for by Colin and his men when an Audioscan Test box arrives from Safeera at Sensory Support Services in Bolton. Not only that but a massive box of hearing aids and a loop system are delivered by the same Parcelforce driver. Alexandra Lindsay at St Peters Hospital in Chertsey sent them. She says there are more than 2000 in the box and I don’t doubt it. The box was a bit battered when it arrived but I do not think any were lost. What a lovely day. Can I get on with sending 4 items to Sri Chandra in Sri Lanka now please? 8 July. After some reboxing Alexandra’s hearing aids are off to Colin at Frankland. 13 July. The postman delivers 8 hearing aids from the lovely sounding Ubley, near Bristol. 14 July. Hooked over the door knob we find a bag containing 9 good hearing aids, collected I suspect by one of our Hastings Lions Lord Elpus, aka Andy Waters. 15 July. Seven more hearing aids arrive, two of which are very rare high powered ones, from a lady in Macclesfield; how splendid. 17 July. Two valuable private hearing aids arrive by post from a gentleman in Scotland. 18 July. In case we cannot make it to Denmark I am sending Ophelia Thom from the Philippines a top quality audiometer and 200 hearing aids. She is visiting a friend there in August. 19 July. Today Her Majesty the Queen confirmed my Membership of the Order of the British Empire (MBE). It was an awe inspiring ceremony at Windsor Castle. May I thank all of you who have played your part in helping me to gain this honour? 19 July. On our return from Windsor there is a large box of 1800 hearing aids awaiting us from Frankland. Colin and his non English speaking workers have produced them for us while the English speakers work towards paper qualifications, in case they might be released at sometime in the future! 24, 25, 26 July. Apologies but I have been medically hors de combat for a while and am now trying to catch up. We have had hearing aids and batteries from Hearing Help Ltd in North Hykeham. Then some bits and pieces (his words not mine) arrived from a gentleman from London NW1. A lady in Cardiff sent 7 high power aids from her late mother-in-law; my she must have been hard of hearing but 7 children will say thanks. Would you believe it but on the same day came another donation from a lady in Merthyr Tydfil, also in Wales. All these are gratefully received. As well as all that Colin at the prison sends us 1850 checked out hearing aids to add to the collection, thanks old chap! 30 July. It is a wonderful, wonderful world (as the great Louis Armstrong sang in the 60s). Two boxes containing a mass, maybe 2000 hearing aids arrive from our Lions HQ in Birmingham. They and we have no idea where they came from. It looks like a hospital has been having a cupboard clear out and did not want them thrown away. It is absolutely marvellous, for many of them are old analogues and are ideal for some of our clients. 1 Aug. After something of a delay we receive two large heavy boxes from our colleagues in Chichester bless ‘em they will take a bit of sorting out. 5 Aug. Bright and early the chap from Parcelforce arrives with five audiometers/tympanometers/analysers from Barry Bardsley in Swansea; a regular cornucopia. 5 Aug. When the postman arrived he delivered two very modern hearing aids and a box of batteries from Acousticare in Poole and six very good analogue aids from a lady in Dunfermline. Thank you very much to both donors. 7 Aug. A fine collection of telephone equipment and 5 hearing aids are delivered from a gentleman in Luton. They were his late father’s. The hearing aids will of course head for the prison initially but the telephones will go to The East Sussex hearing Resource Centre; thank you. 10 Aug. Islah is off on one of her North African jaunts in about a week and gives us rather short notice to ask for 300 hearing aids. Luckily we have them and they are winging in the post to her. 12 Aug. We calculate that about 11,000 hearing aids will be on their way to Frankland prison and an Old FP30 analyser. 14 Aug. A package of hearing aids and batteries are received from our friends at Acousticare in Poole, thanks Val. 16 Aug. Yet another donation received from Acousticare in Poole. Two excellent Phonak models passed to them by a lady in that fair town. 17 Aug. 200 hearing aids are on their way to Dr Chandra Jayasuriya at the National Hospital, Colombo to replenish her stock. 19 Aug. As we have a surfeit of aids at present, thank to Colin and his men at Frankland Prison we are sending 1500 hearing aids to Dr Mike Nolan at the Starkey Hearing Foundation. 27 Aug. I have been somewhat under the weather for the last ten days or so thus these entries are brief. An extremely nice sounding chap in one of my favourite towns, Harrogate has donated his late wife’s high powered Phonak hearing aids. Five aids came from a chap in Milton Keynes with some batteries. Val Bessant at Acousticare sent on a hearing aid from a lady client. Matthew Coward passed us loop system donated by a client of The Hearing Care Centre in Ipswich. Thank you one and all. 28 Aug. A large box of used hearing aids for the prison has arrived from our good friends of the Kelkheim Lions in Germany, via Dr Rudi Erckel. We hope to send him some soon. 4 Sep. 50 high powered hearing aids are off across the North Sea to Rudi in Kelkeim. 5 Sep. Hearing aids and batteries arrive from a very nice lady in Brighton, thank you Sue. 6 Sep. Glyn Vaughan will soon be getting another 500 hearing aids for All Ears Cambodia. 3 Sep. Almost “coals to Newcastle”, for a lady in Durham has kindly donated her late father’s hearing equipment to us. I believe her home is not too far away from our workshop. 14 Sep. While we were away in Wales a parcel arrived, sent anonymously, containing 4 hearing aids. I wish we could acknowledge. 14 Sep. On our return we also received via a neighbour a packet from Sue at Staines containing two valuable amplified telephone systems. Alas, they are not suitable for overseas but will find welcoming homes through our friends in The East Sussex Hearing Resource Centre. 20 Sep. 7.45 am, just as I am getting a cuppa for my wife on her birthday the postman calls with two parcels from Mills and McKinney in London. They contain two valuable hearing aids and a charger and an unused ear mould shaping drill kit. Thank you for both packets, they will find welcome homes; the drill set probably with Islah’s charity in North Africa. 20 Sep. An hour later and the Parcelforce chap delivers 208 analogue hearing aids, some high power. These will possibly be the last for a while as the workshop at the prison is re-locating but thanks Colin. 24 Sep. The postman delivered a very nice parcel today from our colleague Geoff Brechell in Guilford Lions. It comprised a number of children’s hearing aids from a lady living in that area, some other aids and equipment and some in date batteries. A worthy haul and we thank all concerned for bringing them to us. 25 Sep. After a delay in delivering, the postman brings a treasure of a rechargeable working otoscope (used to inspect ears). It arrived from our fiends in London Mills and McKinney Ltd.
27 Sep. A charity called Family Lives has sent us some extremely useful telephonic items, which will be sent on to The East Sussex Hearing Resource Centre, thank you. On the same day we receive from our friends at Acousticare in Poole, hearing aids from two client donors. Again we send our thanks. 30 Sep. Tis the last day of the month and it will be soon time for winter drawers on! Off to warmer climes however, are 220 hearing aids for Dr Chandra in Colombo. As well but via Leytonstone, the drill kit and otoscope, mentioned earlier, are going to North Africa with Islah. We have popped in 200 hearing aids as well. 2 Oct. Today we had a message from a young lady in Sri Lanka, via Dr Zafarullah to say she had achieved a very high mark in an exam because she can hear thanks to one of our hearing aids. Stories like this make it all worthwhile. 2 Oct. 200 hearing aids and around 200 batteries are now on their way top Sri Lanka and Dr Zaff. 9 Oct. Two hearing aids donated by a lady in Bewdley arrive with the postman, lovely and thnks. Bob Harvey of Rye Lions delivers 6 boxes of unsorted hearing equipment. These were passed to him by our chums in Chichester Lions. This shows good inter-club liaison does it not? 20 Oct. On our return from a foray in the northern lands of Scotland and Hull we find on the doorstop two packages containing a total of 12 hearing aids and some batteries. One is from a lady in Raynham, Kent and the other from our friends at Amplifon in Leeds, thank you. 26 Oct. We have managed to sort the latest load of hearing equipment sent by Chichester Lions, a daunting but pleasing task. It is reckoned that we will be sending around 5,000 hearing iads up to the prison for their delectation. Shakespeare Lions, Bridgend, Colwyn Bay and Ruislip have particularly distinguished themselves. However, there are still too many anonymous donation and we like to thank everyone we can. 28 Oct. A nice bundle of hearing aids arrive from Suzie at Amplifon in Leeds, for which we say thanks. 30 Oct. On a visit to a friend in hospital we divert to East Sussex Hearing Resource Centre in Eastbourne to deliver two large boxes of hearing equipment that cannot be sent overseas. 31 Oct. Two packets arrive today. One from a kind lady in the Rhondda Valley and the other from Capital Audiology in London; gratefully received thanks. 2 Nov. A cry for hearing aids is heard from Adam Shulberg at Cubex in London. A party of specialists are heading for Nepal in a couple of weeks. 400 aids are now despatched to answer his plea. 12 Nov. On a filthy day for the poor postman, he still manages to deliver us two packets. Each contains two welcome hearing aids, one packet from a gentleman in Cheltenham and the other from a lady in Penarth. 19 Nov. As promised, a box containing a speech trainer, a bag of hearing aids and some other ancillary items arrive from our friends in Sensory Support Services in Stockport. Well done and thank you. 20 Nov. On yet another filthy day the bedraggled but still cheerful postman delivers three packets. One is anonymous containing one hearing aid. The next is from London, contains 4 hearing aids, batteries and bits and bobs. The last is from a lady living in Worcester Park but whose uncle died recently in Bexhill on Sea aged 103! They live long lives around these parts; thank you one and all. 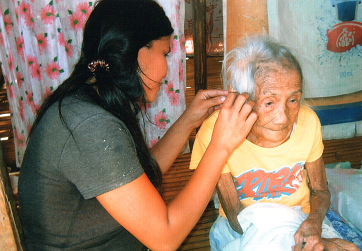 21 Nov. We receive five hearing aids from a well known radio reporter who has just returned from the Philippines. So we know who is going to get them, Ofelia at medical Missions! 22 Nov. The recently arrived speech trainer is on its way to Islah together with an audiometer, for her next foray to N Africa. 27 Nov. The man from Parcel Force nigh on blocks the road delivering five large boxes from Sheffield Service for Deaf and Hearing impaired children. The boxes contain 2 x FP30 analysers. an FP40 test box, 3 x Speech trainers, a front row soundfield and a box of CR220 accessories. We can find immediate homes for most of that, thanks Morna. 29 Nov. A promised box of electronics delights for ESHRC arrives from Michael Nolan before he does another Dr David Livingstone act in the Central African Republic. 30 Nov. From a lady in Tingewick, Bucks is kind enough send her late husband’s two hearing aids with some batteries. If I recall aright I refereed at Tingewick in the early 1950s and we rarely sent anyone off in those days! 5 Dec. From Rooksbridge, a lovely name, Somerset we receive two excellent hearing aids and some batteries. They are most welcome. 6 Dec. A routine trip to the hospital and I pop in to see our friends in audiology and what do you know, I come out with some temporary tips for friend Ashraf in Pakistan. I hope these do not disappear in transit this time! 7 Dec. Two large boxes of equipment and aids arrive for sorting from our colleagues in Chichester. That should give the prison a bit to do over Christmas. 7 Dec. In the post comes a packet from a kind lady in the fine county of Northumberland, Hexham in fact. It contains 6 highly desirable high power hearing aids so thank you Mary. 11 Dec. From a lady, who I believe lives in Cumbria, we receive two modern hearing aids. They were owned by a gentleman in Edinburgh; thank you Anne. 12 Dec. The heirs of a gentleman in Morpeth, my the north is doing us proud at present, pass his two hearing aids on to us via his solicitor. In my twenty years of this job I think that this is a first. Again we offer a big thank you. 14 Dec. The latest boxes of equipment passed on from Chichester Lions have been sorted. Added to those we had already we reckon around 3500 will be on their way north to Frank land. Identifiable contributions from private donors were G Roberts Hearing Care Centre in Welling, Kent and a lady in Oldham. Lions Clubs have done us proud and include in no particular order, Colwyn Bay, Clacton on Sea, Chester, Caterham Oxted & Godstone (COGs), Dunstable, Fairlop, Burgess Hill and four lots from Shakespeare. Well done everyone that rounds the year off nicely, well nearly! 20 Dec. On our return from a day in London we find three soggy parcels at the back of the house. They are from Amplifon Ltd and The Hearing Care Centre in Ipswich and contain a large load of hearing aids; an early Christmas present. Then inside the postman has delivered a packet of 50 aids from Dumfries and Galloway Hearing Group. So we thank you all for these splendid gifts. 21 Dec. From our HQ in Birmingham arrives another packet of 6 hearing aids, from an anonymous donor. The year is ending on a high note because there are three packets waiting for us at the sorting office. My and Santa is yet to call! 23 Dec. I did my Good King Wenceslaus act this morning and went out in the winter windy weather to collect three parcels from the sorting office. It was worth it for they were from our Lions HQ and Taunton and Somerset NHS. The total of aids is around 510. As the late Bernard Matthews would say of his turkeys, bootiful! 24 Dec. Christmas Eve and as I finish sorting all that we have received in the last few days the postman delivers 400 hearing aids from Dr Rudi Erckel. So dear friends we now have nigh on 3,000 hearing aids to send up to Frankland Prison once the festivities are over. And maybe I can draw my end of year report up before we are delightfully deluged again. A FITTING END TO THE YEAR THANKS TO EVERY ONE OF YOU. Yours: Vic Truluck MBE, MJF, Project Leader Used hearing Equipment, 24 Fearon Road, Hastings, TN34 2DL, ENGLAND. Telephone: (00 44) (0) 1424-435564. E-mail: verbic@hastingslions.org.uk.